If there is one feature on Facebook which delivers “social utility” magic even to the most average of users, it’s Photos. In fact the feature is so popular that by Facebook’s own account 1 billion photos are uploaded every month—a staggering number that makes it the largest photo site on the Web. However, as with all good things, there are also drawbacks, and in this case discovery is high on the list. While Facebook makes it super easy to discover photos in which you were tagged, there is no chance that every one of those billion photos are tagged each month. And that leaves a big opportunity. Let me put it another way: How many photos of you are there on Facebook that you’re completely unaware of? 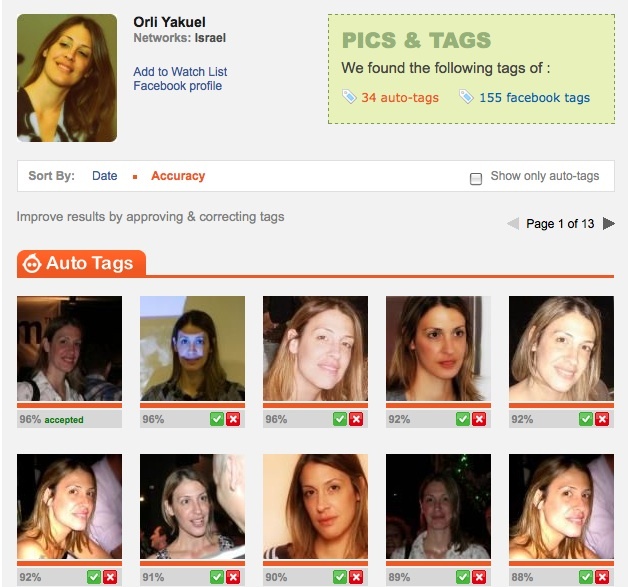 Israeli-based Face.com will help you find them with ‘Photo Finder,’ a Facebook app that uses facial recognition to help members locate untagged photos of themselves and their friends. We have 200 special access invites available to TechCrunch readers who will be granted first access to the app, as well as preference on the waiting list. Get your invite here. Once installed, the app will begin scanning you and your friends’ photo albums, a process that requires a bit of time to complete, but the welcome screen will immediately display photos that were ‘Auto Tagged’. Users can either accept, decline or identify the correct individual themselves. The only users that have veto power to alter or decline a tag are the person who uploaded the photo and the person tagged. Facial recognition technology is taking off. Competing technology can be found in both Apple’s iPhoto and Google’s Picasa, but those are limited to searching only your personal collection of photos (although iPhoto lets you upload them with the tags to Facebook). With Photo Finder, you are not limited to your own photo collection. Users can search manually for photos of friends or browse for recently tagged ones. Users can also track specific users by flagging them for the “Watch List”. Photo Finder will prompt hits via Facebook’s ‘Notification’ window. The facial recognition technology was developed from scratch by the Face.com team over a year and half. It was designed from the ground up as a low-cost platform to meet two specific requirements: The first is recognition of “Faces in the Wild”. This applies to everyday photos that suffer from such issues as low resolution or bad lighting, or where faces are obscured with sunglasses, for example. The second requirement is to have the technology be scalable. In this respect Face.com claims to be able to perform facial recognition on all one billion photos currently uploaded into Facebook every single month using only a few machines. 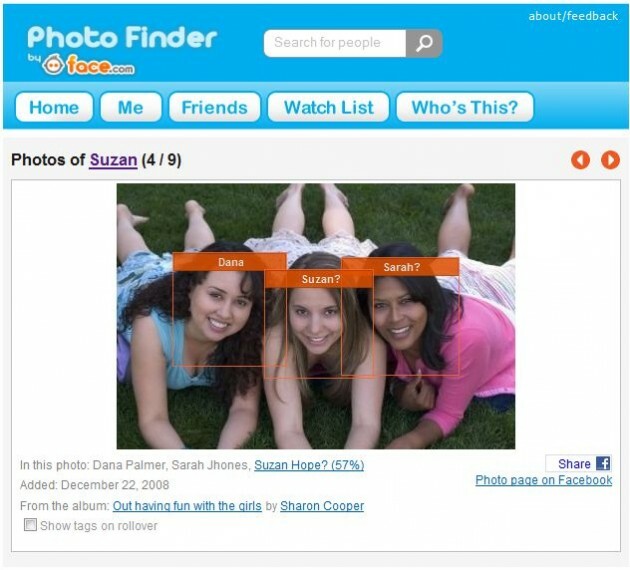 Photo Finder scans the photos of users and all their friends, along with “other albums in your wider network where there’s a high likelihood of your (or friends’) appearances.” To understand the sheer volume of backend work required, consider the following statistics: The first 150 users in Face.com’s system required 20 million photos to be scanned, resulting in 30,000 identified faces. My personal installation of the app required it to scan 79,449 photos which resulted in 11,933 tags of myself and my friends. Photo Finder will then go back and re-scan the albums after its initial scan to identify newly added photos. The social tagging feature within Facebook Photos gives Face.com a major boost because it can use those tags to train its system. It is important to note that Photo Finder does not add or alter Facebook’s own photo tags. Tagging that occurs through the app is stored in metadata accessible through the Photo Finder app alone. Also noteworthy is the fact that from a privacy perspective Photo Finder piggy-backs on the users’ Facebook settings and does not alter them in any way. Also, none of the photos are stored on Face.com’s servers. These only perform the heavy lifting required for the facial recognition and the storing of tags added through the app. Even though this is an Alpha version of the app and there are occasional bugs, it works remarkably well. I was quite surprised that it was able to correctly identify individuals in side shots, backgrounds, or in extremely poorly lit photos. It all depends on the amount of photos available, but as a rule of thumb the Face.com team aims for 90% accuracy. It seems that they have some real technology on their hands as evidenced by their scoring first place in the “Labeled Faces in the Wild” experiment conducted by the University of Massachusetts’ Computer Vision Laboratory (Face.com are identified as ‘Hybrid descriptor-based’ in the linked paper). It’s clear that Photo Finder was designed for mainstream viral appeal and I must admit that I found the app to be VERY addictive, spending at least ten minutes tagging people every time I played with the app over the course of the past two weeks. I have a hunch that once made publicly available the app is going to be incredibly popular on Facebook.